Nothing has ever stopped John Ruf JD’93 from sailing — not the operations or radiation he underwent as a child to treat a tumor on his spine, nor the paralyzing injury he suffered after a car accident in 1998, when his mode of transportation became a wheelchair. 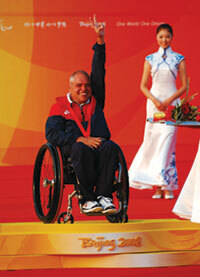 It was during the 2000 U.S. Paralympic Team trials that Ruf first faced the 2.4mR. Being used to conferring with crew on tactics and having extra hands available to trim sails, “single-handing” took some adjustment. 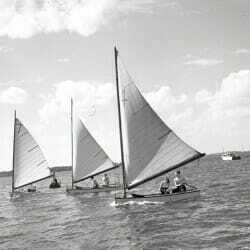 What didn’t take adjustment was competing against able-bodied sailors: that’s how Ruf grew up on Pewaukee Lake, Wisconsin, and the majority of his training has been in mixed fleets of disabled and able-bodied sailors. Ruf threw vigor, determination, knowledge, and extensive international travel into excelling at the 2.4mR, but came up a bit short when attempting to qualify for the 2004 Athens games. 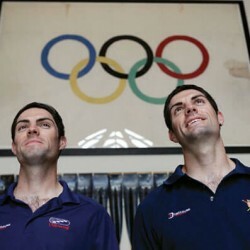 After taking some time to center his goals, however, he became so skilled by the next Paralympic Team trials in October 2007 that he took first place and thus earned a berth. And so it was that in September, Ruf went to Beijing to compete in his first Paralympic Games — billed as the largest athletic competition next to the Olympics, and held at the same venues. There, at the Qingdao Olympic Sailing Centre, he earned the bronze medal. When he’s not sailing, Ruf is a Milwaukee-based attorney, vice president, and compliance officer at the investment advisory firm of R.W. Baird … but when you’re a competitive sailor, your mind is never far from the next race.